Concrete is a building material made from a mixture of Portland cement, sand and water. 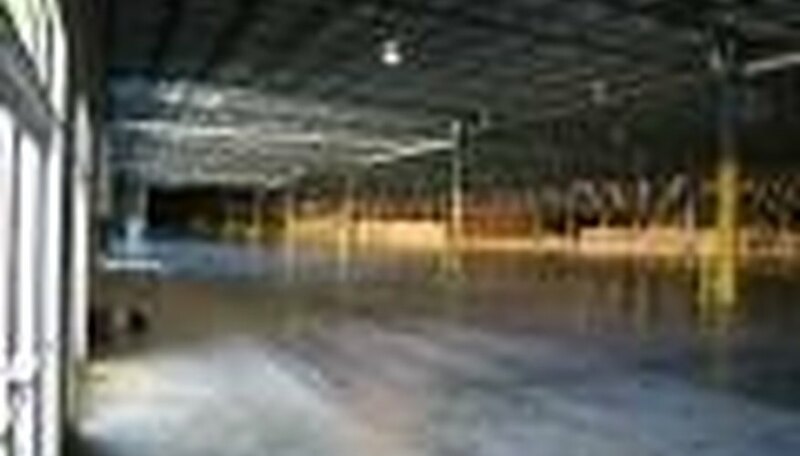 It is used to construct floors, foundations and walkways in a variety of commercial and residential structures. Though this material is known for its strength and durability, concrete suffers damage because of high levels of abuse or improper installation. Concrete typically shows damage in the form of cracks, which can range from light surface fractures to holes that are large enough to make a structure unusable. The most common cause of cracks in concrete is the shrinkage that occurs as the material dries. As concrete cures, the water that has been mixed with the cement and sand begins to evaporate. This causes the concrete to shrink slightly. Because the concrete surface is restrained by form work or surrounding objects, it tries to resist the effects of shrinkage. The additional tension on the material that occurs when the concrete shrinks leads to cracks. This is often addressed through the use of control joints, which are joints placed in the concrete that cause it to crack in a straight, even line. These joints are later filled with grout or caulk to mask their appearance. Temperature change is a major cause of cracks in large concrete applications. This is because of the temperature variations between concrete that is poured first and subsequent layers of concrete. These temperature variations can cause some portions of the slab to expand while others are shrinking, which leads to cracks. The more extreme the difference in temperature, the more dramatic and deep the cracking will be. Some of the most severe cracks in concrete are caused by inadequate structural support, which occurs when the soil beneath a concrete slab shifts position or is eroded by wind and rain. It can also be caused by poor installation, including improper use of rebar or insufficient form work. Concrete that lacks structural support can suffer catastrophic failure, which can cause injury to occupants as well as a great deal of property damage. Many items made from concrete contain metal reinforcement, which help increase the material's tensile strength. These reinforcements include wire mesh, rebar or steel beams. If these materials start to rust, the rust will cause the concrete to expand. This expansion can cause hairline cracks and small surface cracks. After the metal has started to rust, the resulting cracks will allow more water into the concrete, which will result in even more rust. To solve this problem, galvanized metals should be used for their ability to resist corrosion and rust. Spalling is the term given to concrete that has a rough, flaky surface. This condition is the result of hundreds of tiny cracks, which usually appear only on the surface of the concrete. Spalling typically occurs when too much water is added to the concrete mixture, or when the surface layer dries faster than interior layers. If the water evaporates too quickly, the resulting increase in tension will be too much for the concrete, causing it to crack. This type of surface problem can sometimes be fixed with topping layers or seal coats.